Malaysia appears set to revive its Look-East Policy in order to deepen its collaboration and strengthen business competitiveness between both Malaysia and Japan following Pakatan Harapan’s victory in the recently concluded 14th general elections. Malaysia’s pivot to the east was the brainchild of our present Prime Minister Tun Dr Mahathir when he had first held the post in 1981. He then felt that Malaysia needed to emulate the many qualities from countries such as Japan and South Korea in order to be successful in the holistic sense. From the ashes of the Second World War, Japan had risen to be a formidable economic force through sheer grit determination and hard work and that Malaysia had a lot to benefit from these countries if it goes down that route. There is a great deal that can be learned in terms of work ethics and development models that would be more suited to Malaysia especially in the context of striving to be a developed nation. Towards bringing this into fruition, there is a greater need to consider the establishment of Centre of Japanese Studies in Malaysia that would attempt to allow Malaysia study the various positive aspects of the Japanese culture is its work ethics, its ability to acquire its technological prowess, its education system and the various other development models that would be useful to us. In the assimilation of the Japanese value systems in Malaysia, it is paramount that Malaysia ensures that there are many positive virtues of our cultural values are preserved and not discarded as there are virtues that have allowed us to stand out too. 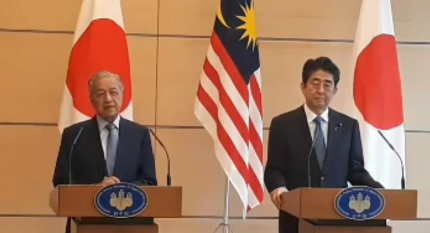 With Malaysia’s tilt towards Japan, it is equally important for Japan to also play a pro-active role in posturing its relationship with Malaysia and re-asserting its rightful role in the region through Malaysia. In Malaysia, Japan has a history of assisting Malaysia’s economic development through its foreign direct investment in Penang making Malaysia as the hub for the electronics and electrical sector. It now must now take an aggressive stance in assisting Malaysia towards achieving a developed country status through identifying areas of technology transfer, assisting in research and development through collaboration with local universities and institutions of higher learning in the country. The proposed centre of Japanese studies should also look at national security issues, trade and economic co-operation that will bolster its presence in the region. Aside from this, the centre could also look towards assisting Japanese MNC’s and businesses thrive and prosper in the country. The centre could pave the way for Japan to re-assert itself as a formidable economic force in the region through genuine aid and assistance to needy countries.